Wings and Whistles provides a safe, clean and comfortable environment for your pet when you have to be away. 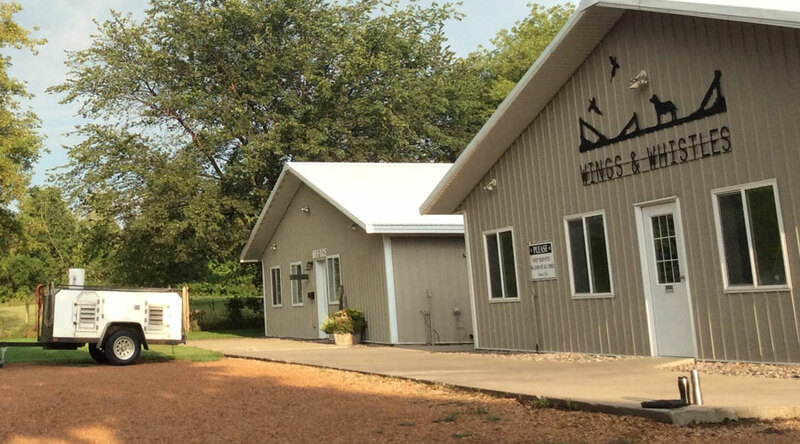 We built our facility for big hunting dogs so your dog will have a lot of space. Each dog has its own private, spacious run with Kuranda cots and platform beds for your dog to use if it wants. Each dog is let outside individually in the morning, afternoon, and evening. Throughout the day, it is a very busy place—your dog will not be bored. All breeds are welcome to stay with us. We have handled everything from the smallest Chihuahuas to big (pony size) Newfoundlands and Great Danes. We love the variety of dogs. We love to get to know your dog and discover its personality. Consider our place its home away from home. Our goal is to make sure every dog is safe and happy.